Portlets are the boxes of dynamic content that appear in the sidebars of a Plumi site (outlined in red boxes in the screenshot below). As a site Manager, you can change the order in which these appear, and add new portlets. This is just one of the ways you can change the layout and design of your Plumi site, please consult the design chapter for more info. Note: screenshots for this section of the manual are from the default Plone visual theme, which looks slightly different to the Plumi visual theme. The Home Folder is where the site administrator can manage the portlets for most of the site. If you configure portlets in any other folder on the site, your changes will only have effect in that folder. Make sure that you are on the Home page of your site. Click the manage portlets link at the bottom of either the right or left column. Note: there are two pull-down menus on either side of this page. Each pull-down lists all of the portlets that are in a Plone site. To add a portlet, select the name of the portlet from the drop down where you would like the portlet to display. If the portlet you have selected requires configuration, a screen will appear that allows you to fill in this information. 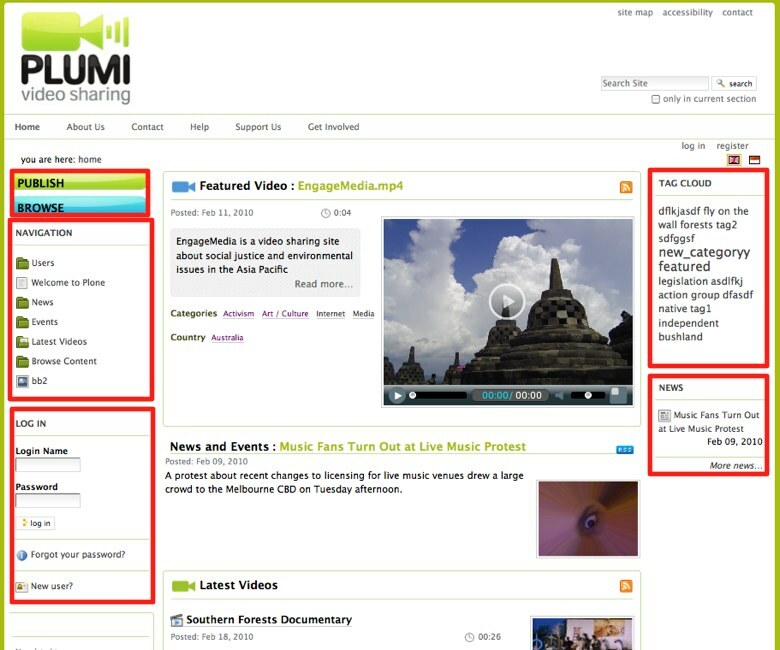 Once you click Save, Plone (Plumi) will add this portlet to your home page and across the entire site. You can use the Portlets assigned here controls to rearrange the display order of your portlets or to remove a portlet from the display. Click the up or down arrow to reorder portlets. If you want to remove a portlet from the display, click the red X. Note: any portlet managment that you do in the Home Folder affects your entire Plone site. However, you can override these selections using the Block/unblock portlets controls within folders and on individual pages. Credits: The information above is from: http://plone.org/documentation/kb/how-to-manage-portlets-in-plone-3 (visit this page for further info including how to fine-tune portlet display at the folder level, manage portlets on a group or user basis, or how to manage portlets using your Dashboard.